Ely Consort, directed by Matthew Rudd, is an excellent choir and obviously delighted the packed audience in Ely Methodist Chapel on Saturday. Their singing was a very high standard and as a choir it proved particularly competent at fusing complex chords into emotive, cohesive harmony. Many of the pieces in the programme were new and those of us who are wary of contemporary composers were given a very pleasant surprise. Matthew obviously knows his music and the selection chosen for this programme, which included many modern-day composers, was particularly musical and delightful. Pianist, Charlie Penn, and cellist Anna Jones also made and excellent contribution to this lovely programme. Charlie had some highly challenging material to play, and he managed it all with real panache. It was very pleasing to hear the rich tones of the cello. In ‘Serenity’ (‘O Magnum Mysterium’) by Ola Gjeilo, the cello was especially well integrated, making the piece meaningful, heartfelt and expressive. Other highlights for me were ‘Time is Endless’ by Vytautas Miškinis, ‘Cantata Domino’ by Ko Matsushita, ‘The music of stillness’ by Elaine Hagenberg and the final ‘Polovtsian Dances’ by Alexander Borodin. ‘Time is Endless’ contained gorgeous, ethereal harmonies, ‘Cantata Domino’ was tuneful with a tinge of attractive melancholy, ‘The music of stillness’ had a beautiful, sustained texture with exquisite harmonic changes that were clearly expressed, and the excitement and exotic exuberance of the Polovtsian Dances ended the evening perfectly. None of this detail would have been possible to enjoy without the skill and sensitivity of this wonderful choir and its director. Ely Consort is a name to be reckoned with. This must be one of the best choirs in the district. It isn’t until you hear good quality music produced by an excellent choir like this that you realize what you have been missing. Director Matthew Rudd really knows how to shape and develop a beautiful, well balanced sound and how to vary the pace, rhythm and dynamics to create mesmerising effects. Russian Orthodox Church music brings to mind deep bass voices singing in open harmony. Tonight we certainly had the gorgeous deep basses and also a well produced tone in each of voice parts. With the gorgeous sound this choir produced echoing round the Lady Chapel it was easy to imagine we were transported into the depths of Russia. The theme of the evening: remembrance, commemoration and reconciliation was well reflected in the pieces. The programme was based around Rachmaninov’s unaccompanied ‘All Night Vigil’. The powerful richness of the voices was apparent from the start. Singing in Russian, this choir’s attention to detail, its expressiveness and precision were exceptional. Other works included David Bednall’s ‘To a Missing Friend and ‘The Soldier’, a delightfully refreshing ’Do not Stand at my Grave and Weep’ by David Jepson, the tumultuous ‘Ring out, Wild Bells’ by Jonathan Dove and the first performance of a commissioned work by Sarah Quartel ‘’Hope’ is the thing with feathers’. Sarah’s work was undoubtedly one of the highlights of the evening. Her charming lyrical piano accompaniment and the way she coloured the words so adorably and effectively made this piece most effective. The sense of the lightness of a fluttering bird, rising above the storms in life was never lost. Charlie Penn’s accompaniments were superb. He achieved amazing effects in Jonathan Dove’s ‘Ring out, wild bells’. This was indeed an excellent concert. The next events to look forward to are concert on Saturday 15th December at All Saints’ Church in Cottenham, on Saturday 16th March in Ely Methodist Church and on Saturday 29th June in St. Mary’s Church, Burwell. For more information contact info@ elyconsort.org.uk. Matthew Rudd (Director), Ely Consort and Edmund Aldhouse (organist) presented a magnificent concert on Saturday. The programme was packed with appropriate works for the season. Usually, the word ‘challenging’ denotes pieces that are too difficult for the performers, but on this occasion, the challenging works chosen for the first half of the programme were beautifully handled by these fine musicians. Choir, conductor and organist were of one mind and throughout the evening their music was exquisitely shaped, the parts clear and well-balanced, the tonal quality first-rate, the dynamics (louds and softs) effective, and rests and detached notes wonderfully controlled. The vocal technique of these fine singers was constantly apparent. The first pieces were highly appropriate: works by Britten (for his 100th anniversary) ‘Hymn to St. Cecilia’ (choir) and ‘Prelude and Fugue on a theme of Vittoria (organ). ‘Andreas Christi famulus’ by Crecquillon marked St. Andrew’s Day. Works by Howells included ‘Sarabande in modo elegiac’ (organ) and ‘Take him, earth, for cherishing’ (choir). Of this first group of pieces, the highlight for me was the very moving ‘Take him, earth, for cherishing’ commissioned for the memorial service for President Kennedy after his untimely and sudden death. The words were keenly expressed with moments of great anguish and agitation contrasted by very moving episodes of prayerful application. It was in the second part of the programme that the choir really let its hair down and we revelled in more traditional favourites. These were very musically and movingly expressed beginning with a wonderful rendition of ‘O come, O come Immanuel’ arranged by John Rutter. Other delights featured work by Michael Praetorius, Stanley Vann, Carter, Mendelssohn, Bach, Vaughan Williams and Poulenc. 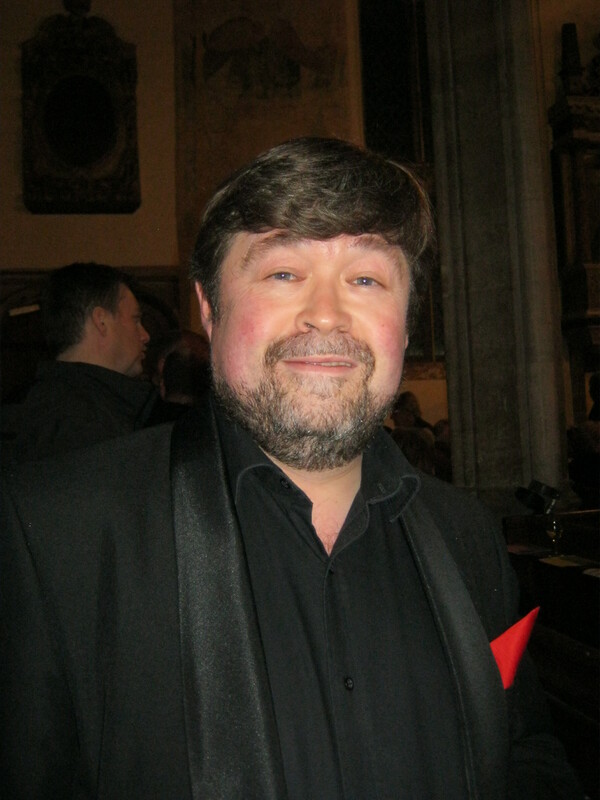 One notable extra was a moving composition by Edward Skelton (previously a key member of the choir). Edmund Aldhouse supported the singers admirably as well as performing a number of solo items that balanced the programme well. The one that appealed to me most was ‘Toccata on Veni Emmanuel’ by Andrew Carter. Edmund let rip on the new organ in St. Andrew’s Church and performed this rousing work with a real sense of drama and panache. Overall, this was indeed a magical evening of high quality music and the encore, ‘Nova, Nova’ by Bob Chilcott ended to evening perfectly. Ely Consort , Burwell Village College Year 6 Singers and Perse Girls Junior School Choir warmed the hearts of a packed audience on a chilly night in St. Mary’s Church, Burwell on Saturday 9th March 2013. These fine singers presented a host of entertaining and beautifully produced material. With Matthew Rudd directing, Ely Consort opened the event with some splendid American numbers arranged by Daryl Runswick: ‘Yankee Doodle’ and ‘Shenandoah’. ‘Yankee Doodle’ opened the concert with a lively and spirited performance followed by a deliciously smooth, nostalgic ‘Shenandoah’. In memory of Dave Brubeck who died last year, an instrumental group consisting of Claire Stevenson (saxophone), Daphna Sadeh Neu (bass), Jonathan Lilley (piano) and Roger Bett (drums) had us tapping our toes to ‘Take Five’. The contributions by Claire Stevenson and Jonathan Lilley were particularly impressive. Tonal beauty and well-shaped phrasing by Ely Consort endeared us to a lovely performance of ‘Sure on this shining Light’ by Morten Laurisden which was followed by a highly charismatic series of songs from Gershwin’s ‘Porgy and Bess’. John Simmons (solo bass) was particularly good, revelling in the role. After interval the full choir brightened up the church with a stimulating performance of Alexander L’Estrange’s ‘Zimbe’, an exciting collection of songs from Africa. This composition suits a large choir and sounds from Ely Consort were well matched with the Junior singers. The flow of rhythmic chants, the melodious harmonies of the native African styles and the joyful involvement of the singers captivated the audience. This was indeed a wonderful concert and you should book early for Ely Consort’s celebration of its 25th Silver Jubilee Anniversary concert on Saturday 22nd June at St. Andrews in Sutton. (pictured soloist John Simmons) Ely Consort , Burwell Village College Year 6 Singers and Perse Girls Junior School Choir warmed the hearts of a packed audience on a chilly night in St. Mary’s Church, Burwell on Saturday 9th March 2013. These fine singers presented a host of entertaining and beautifully produced material. With Matthew Rudd directing, Ely Consort opened the event with some splendid American numbers arranged by Daryl Runswick: ‘Yankee Doodle’ and ‘Shenandoah’. ‘Yankee Doodle’ was a lively and spirited performance which was followed by a deliciously smooth, nostalgic ‘Shenandoah’. After interval the full choir brightened up the church with a stimulating performance of Alexander L’Estrange’s ‘Zimbe’, an exciting collection of songs from Africa. This composition suits a large choir and sounds from Ely Consort were well matched with the junior singers. The flow of rhythmic chants, the melodious full harmonies of the native African styles and the joyful involvement of the singers captivated the audience. The concert by Ely Consort, ‘400 Years of Choral Music’ in the Lady Chapel, Ely Cathedral on Saturday 1st December 2012 was magnificent – a most fitting memorial to Giovanni Gabrieli who died some 400 years ago. The concert opened with his Jubilate Deo which echoed beautifully around the Lady Chapel in true Gabrieli style. Under the directorship of Matthew Rudd this choir has developed into a phenomenal group. A full rich tone, carefully and expressively shaped phrases, precise entries and rhythmic cohesion mark their performance every time. This concert was especially enjoyable because of the varied programme that included many ‘old favourites’ and a number of new pieces that, even on a first hearing, were fresh, vital and contained very attractive combinations of sound. The internal passion and exciting climaxes of Bruckner’s Christus factus est and Locus Iste, the appealing harmonies and flowing movement in Fauré’s Cantique de Jean Racine, the stable serenity of Hassler’s Dixit Maria, the poignant discords in Mozart’s lighter-styled Sancta Maria, mater Dei and more serious Ave Verum Corpus were all beautifully sung. An evening of such glorious music would have been sufficient, but this time these fine singers gave us more. The modern works by Dubra, Will Todd and Lauridsen were enthralling, using modern techniques that enhanced their musical appeal. Dubra’s Veni Sanctus Spiritus contained challenging moments for the singers that were well mastered. Will Todd’s The Call of Wisdom conveyed perfectly a sense of the serene calm of wisdom with its expansive uplifting and deeply spiritual dimensions. I can’t wait to hear the piece Will Todd is composing for Ely Consort next September 7th to celebrate Ely Consort’s 25th anniversary. The Lauridsen Nocturnes with their international appeal using different languages, captured exquisitely the special romantic potency of a warm summer’s evening. Jonathan Lilley provided essential and empathetic accompaniment on chamber organ or piano as required. His phenomenal musicianship was very much in evidence in his solo performances of Mozart’s Fugue in Eb K.153, A Little Gigue’ K.574 and Debussy’s Jardins sous la pluie. You could almost feel the rain on the gardens in the Debussy. The concert ended magnificently with Poulenc’s joyful, declarative Hodie Christus natus est. Ely Cathedral’s Diamond Jubilee Concert was a resounding success. The Cathedral stage was filled with some of Ely and Cambridge’s finest musicians, the Cathedral building was decorated with an uplifting array of bunting and the seating filled to capacity by a huge crowd of enthusiastic participants. There was no doubt that this evening was going to be a magnificent experience. The tone of the occasion began well with a special forward in the programme by none other than Prince Philip who wished us ‘an enjoyable evening’. Paul Trepte, Director of Music at Ely Cathedral, selected a magnificent collection of music associated with royalty and coronations for the programme. An amazing massed choir gelled superbly under his direction and included Ely Cathedral Choir, Ely Cathedral Girls’ Choir, The Ely Imps, Ely Cathedral Octagon Singers, Ely Choral Society, Ely Consort and Ely Youth Choir. This amazing concert also featured one of the best orchestra’s of the region: The East Anglia Chamber Orchestra as well as the renowned Assistant Cathedral Organist, Jonathan Lilley. The concert opened appropriately with Stanford’s ‘Coronation Gloria’ which contained the expected glorious choral and orchestral sounds. The orchestra then played a selection of movements from ‘Music for the Royal Fireworks’ by Handel. Under Paul’s direction this familiar music was enhanced with his own special brand of vitality and momentum. The precise dotted notes in the overture added to the sense of pomp and ceremony. A light, cheerful Bourrée was followed by a graceful ‘La Paix’. ‘La Réjouissance’ exuded a special Handelian quality while the final very familiar ‘Menuet’ was filled with grandiose gestures fitting the occasion. The ‘Coronation Te Deum’ by Walton challenged the performers and listeners with complex, changeable textures, declarative episodes and widely varied expressions. This was music of the highest quality performed by musicians of impeccable talent and ability. Walton’s more familiar ‘Crown imperial’ for orchestra featured later in the programme when Paul demonstrated particularly well his ability to infuse the performance with a precise rhythmic drive, energized vigour and new subtleties of expression. As a complete contrast, we were then treated to one of the ‘old favourites’ ‘The Dambusters March’ by Coates. Paul again demonstrated his unique ability to breathe fresh buoyancy and life into familiar ground. Britten’s unaccompanied Choral Dances from ‘Gloriana’ by Britten was another contrast containing prime examples of his particular style: his special harmonies, rhythmic demands and characterizations. The almost ‘giddy’ Country Girls balanced the manly Rustics and Fishermen while the Final Dance of the Homage was filled with appropriate gentle strands lovingly woven together. No concert like this would be complete without Parry and he featured with the much adored ‘I was Glad’ ‘Blest pair of sirens’ and ‘Jerusalem’. In ‘I was Glad’ this massive choir gave Parry’s high notes volume and depth, in ‘the Blest pair of Sirens’ they gave gentility to the interwoven lines and nobility to ‘Jerusalem’. There was nothing strained or restrained about these performances. A taste of Vaughan Williams in ‘An English Folksong Suite’ for orchestra gave performers and listeners the opportunity to revel in this composer’s special ‘Englishness’ in all the variations offered. The evening ended with the much anticipated audience participation and the Cathedral was filled with the sounds of patriotic voices singing Holst’ s’ ‘I vow to me my Country’, Elgar’s March: Pomp and Circumstance no.1, ‘Rule Britannia’, ‘Jerusalem’ and Elgar’s variation of the ‘National Anthem’. The choir relaxed and spontaneously moved as one, jigging or swaying in true ‘Last night of the Proms’ tradition as delicate petal-like confetti drifted gently from the octagon above. At the end of this rousing singing the Cathedral erupted into loud cheers. A final indulgent rendering of ‘Land of Hope and Glory’ brought this amazing, wonderful event to a reluctant close. Review of ‘The Dream of Gerontius’ by Elgar performed by Ely Choral Society, Cambridgeshire Choral Society, Ely Consort and the Ely Festival Orchestra in Ely Cathedral on Saturday 31st March 2012. Elgar’s ‘The Dream of Gerontius’ performed by Ely Choral Society, Cambridgeshire Choral Society, and Ely Consort and the Ely Festival Orchestra in Ely Cathedral on Saturday 31st March 2012 was an unforgettable, moving and uplifting experience. Under the baton of Andrew Parnell, these fine musicians captured the essence of Elgar’s genius. With carefully shaped and measured precision, the messages of the text were abundantly clear. Every essence of the journey of the soul of Gerontius and its final release in death was made important and meaningful by these impressive musicians. The audience felt a sense of awe and reverence —most fitting in the inspiring environment of Ely Cathedral. The combined choir excelled. With a full, wholesome sound, these singers sang with informed assurance, no matter what this momentous score demanded. Their effects ranged from the solemn prayers of the Assistants and the harsh brutality of the Demons to the ethereal beauty of the Choir of Angelicals. Even in the most interwoven of textures, no opportunity was lost to savour the expressive magnitude, heightened tensions, and profundity. The orchestra was indeed on equal terms with the singers and these highly skilled instrumentalists balanced perfectly to help create this wonderful, emotional experience that captured the painful anguish of Gerontius’s experiences exactly. In the opening bars it became immediately apparent that we were about to experience something momentous. With both orchestra and choir every utterance was exact but evocative. Tonal richness, effective timing and cohesive, wide-ranging expression were clearly the order of the day. Jonathan Lilley’s organ playing was also an essential contributor. There was a marked hush at the end of the sections. The listeners had been deeply affected. The soloists were some of the finest I have heard in Ely Cathedral. Justin Lavender (tenor) was a highly charged Gerontius, his superb voice permeating the words and music with phenomenal emotional intensity. Jeremy White (bass) filled the Cathedral with his powerful voice. The first notes he sang as the Priest revealed him to be a man worthy of the role – one who could fill the Cathedral with astounding tonal control, power and authority. Deborah Miles-Johnson (mezzo-soprano) sang superbly, adding warmth and affection to Elgar’s uplifting music. This was a most successful evening. There was no doubt why the Cathedral was packed. Saturday 8th December, St. Mary’s Church, Ely Christmas Concert. From the time Matthew Rudd took over the directorship of Ely Consort in 2002, it has grown in numbers and stature. Under his astute directorship, the tonal quality, clarity and polish this group of fine singers has developed has become more and more remarkable. In their performance on Saturday these qualities were particularly evident in the motet Beati quorum via by Charles Villiers Stanford. The harmonies were beautifully balanced and entries and closures of effortlessly sustained lines were precise but not too precise to damage the wonderful resonance that filled the presbytery in Ely Cathedral where the concert took place. The ranges of expression, changes of mood and the gradual development of tension, dynamics and climaxes were wonderfully crafted by this excellent conductor and these marvellous singers. These qualities were also especially apparent in Samuel Sebastian Wesley’s Blessed be the God and Father, Justorum animae by Stanford and the opening and closing Selig sind …, in Brahm’s Requiem. The words ‘But the word of the Lord endureth forever’ in Wesley’s piece built to a most effective climax. Two impressive soloists performed with the choir. Francis Brett (baritone), who in the early days of his career won a choral scholarship to King’s College Cambridge, and our Ely-based diva Catriona Clark (soprano) enhanced the evening with first rate performances. Francis sang Herr, lehre doch mich, the third movement of Brahm’s Requiem, with mesmerizing warmth and potency. His superb technique engendered a sense of effortlessness as he captured the expressiveness of the text exactly. His contribution to the sixth movement of the Requiem, Denn wir habern hie keine bleibende Statt, brought out significant words with special clarity and colour. Catriona Clark sparkled with her light, vibrant and well focused tones. She featured in Wesley’s Blessed be the God and Father and Ihr habt nun traurigkeit from the Requiem. Her solos by Brahms contrasted well. The first Wie Melodien was charming and gentle with key notes clothed with expressive warmth and the second song by Brahms, The Vain Suit was in English and a highly entertaining moment of humour not always apparent in Brahm’s usual profound style. Jonathan Lilley, assistant organist to Ely Cathedral, accompanied with his usual expertise. The smooth fingerwork and empathy with the Cathedral’s organ were particularly apparent in his solo Postlude in D minor, Op 105. No 6 by Stanford. The declarative rousing melodies and the softer interwoven textures were putty in this highly accomplished performer’s hands. The Consort is undoubtedly one of the finest choral groups in the area and among many of their spine-chilling moments was their performance of Denn alles Fleisch es ist wie Gras (For all flesh is as grass), the second movement of the Requiem as Matthew drew out the most sinister of sounds to complement the funeral-march of the organ. Matthew’s skill in moving smoothly from one mood to another, changing pace and texture was particularly noticeable. This was indeed a splendid concert. The next event by Ely Consort includes a performance of Walton’s Coronation Te Deum in their concert on Saturday 25th June 2011 in St. Andrew’s Church Sutton. Stretham Feast concert, St. Jame’s Church, featuring Alternative Medicine and Guests on Friday 14th May 2011 at 7.30 p.m.
East Anglia Chamber Orchestra (EACHO) featuring music by Bach, Copland, Albinoni and Dvorak in Ely Cathedral on Sunday 3rd April 2011 at 5.15 p.m.
Cantate Jubilate with works by Tallis, Purcell, Byrd and Stopford at St. Margarets’ Church Chippenham, Cambs. on Saturday 9th April at 7.30 p.m. There is something quintessentially magnetic about Benjamin Britten’s work ‘A Ceremony of Carols’. Used to hearing it sung by boy trebles, the purity of the harmonies and the charismatic lines of Britten’s style draw me to it immediately. When I noticed that Ely Consort were presenting this work, albeit in a four-part arrangement, I had to hear it. As the choir began moving up the aisle of the Parish Church in Chatteris, singing the opening ‘Procession’, I was transfixed. Harpist Cecilia Sultana de Maria struck the first notes of ‘Wolcum Yole’ and the precision of the performers, their confident beginnings and effective contrasts were captivating. Under the directorship of Matthew Rudd, this excellent choir produced wholesome sustained lines and moments of great beauty and expressive splendour, especially in the ‘Procession’ and ‘Recession’, ‘There is no Rose’, ‘That yongë child’ and ‘Balulalow’. Choir and harp exuded joy in ’As dew in Aprille’, we were well reminded of the freezing night outside by ‘Freezing Winter Night’, and the emphatic ‘Deo Gracias’ certainly rang true. This was a special performance and the evening was made all the more enjoyable for the contribution by members of the choir as soloists and at one stage, one of them even turned conductor. The fine soloists included Miriam Brown (soprano), Lydia Hill (soprano), Martin Kenward (tenor), Jacqueline Lyons (soprano), Christine Bullen (soprano), Clare Hambling (soprano), Helen West (soprano) and Peter Lancaster (tenor). Martin Kenward’s contribution in ‘Ave Maria’ by Franz Schubert was especially impressive and no doubt somewhat influenced by the fact that the work has been performed at Matthew’s wedding in Ely Cathedral earlier in the year. This work was conducted by Martin Gent while Matthew took his place amongst the choir. Throughout the evening, Cecilia Sultana de Maria Harp made her harp a vital and integral part of the concert. Her precise articulation, the multi-dimensional fabrics she created and her beauty and charm captured the audience. Her solos ‘Fantasy’ by Louis Spohr, and ‘Impromptu-Caprice by Gabriel Pierné were highlights of the evening. The sizeable audience warmed to these wonderful musicians and the encores by harp and choir were well deserved.